All of our cabins and cottages are fully equipped for housekeeping (including linens). Each has a washroom and shower, electric range, fridge and a fireplace. Of course all are fully furnished. All cabins are either on the water or just a few minutes walk from the beach. Each unit is different with it's own individual charm. 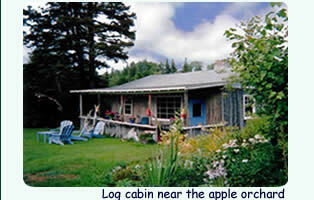 Our cabins were built in the late 1930's and continued to be built until the last in 1955. They were all built by Clyde's grandfather and father. They are rustic, very clean and and comfortable. All units are well maintained and keep their original charm. In Hubbards there are many services - groceries, banks, hairdressers, library, medical centre, bowling alley, fine restaurants to pizza take-out, retail outlets, gift shops, plus many more. All of this is a two minute drive or 20 minute walk. A traditional lobster supper is located on the property. We are very centally located. Halifax, Lunenburg, Peggy's Cove, are all within a 45 minute drive. On our property, we have a beautiful white sand beach, canteen, modern laundromat, horseshoe pits, basket ball net, video games, lobster suppers, plus beautiful walking trails. There are also regular saturday night dances, with talented local bands. OFFICE HOURS 9 a.m. to 9 p.m. Please visit the "campground" link at the top or bottom of this page to view cancellation policy.